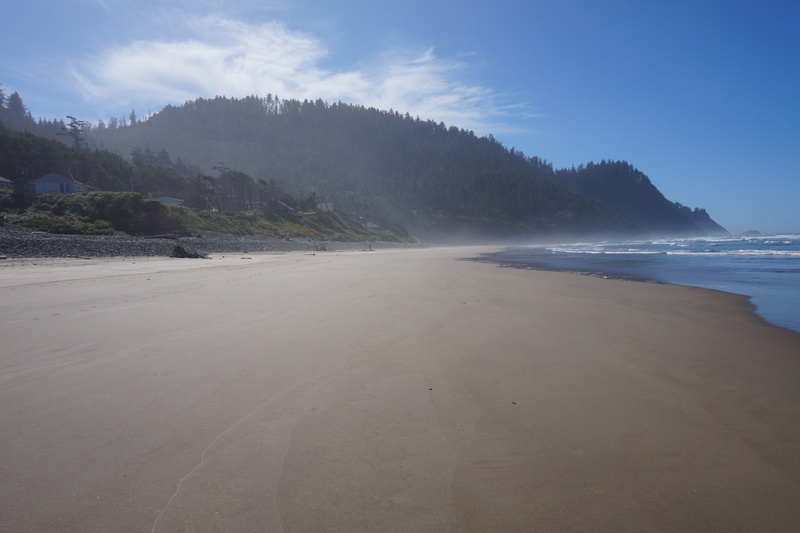 My Dad wanted to take over my writing duties so he could write about his vacation out in Oregon. Think again. You tell me what happened and I’ll write the story. I’m sure you have better things to do. Blah-blah-blah. That took all of five minutes, sounds like you had a great trip. But what is with all the dogs? You’re out of town for five days and I am left at home with Uncle Ed and you forget all about me? OK, OK…I’ll write the story. I think the Scion xB is dirty, this is probably a good time to go out and wash it. This is JACK. A traditional black & white Border collie. This photo was taken in the parking area at the Mount Neahkahnie overlook, also known by My Dad and his sister, Mary, as “Tingle Town” because of the sheer cliff wall adjacent to the parking area. JACK does not bark in the car. His Mom and Dad had “Just Married” painted on the windows of their Subaru. Jack was amenable to petting from My Dad. 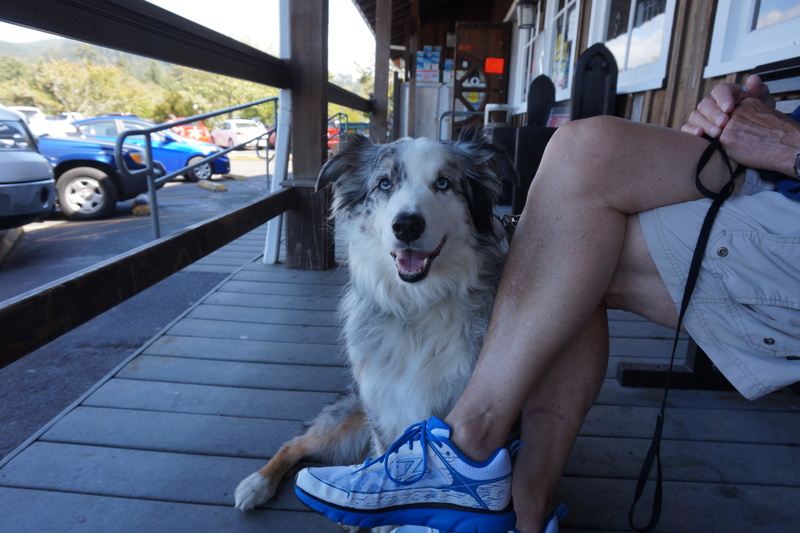 This is ZIG-ZAG, a blue merle/blue-eyed Aussie who was with his Mom and Dad outside the food market in downtown Cannon Beach. He let My Dad pet him but he was VERY attached to his Dad, a USMC veteran who had served in Vietnam. This is ALLIE (I think). 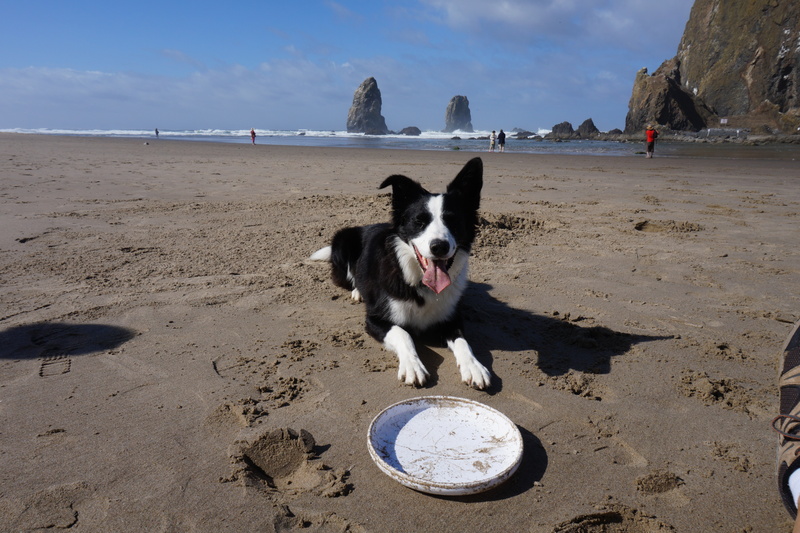 She is a black & white Border collie who was VERY fixated on her Frisbee – GO FIGURE! My Dad said that he threw the Frisbee to ALLIE four or five times…she is a very good catch (GO FIGURE). That is Haystack Rock in the background. 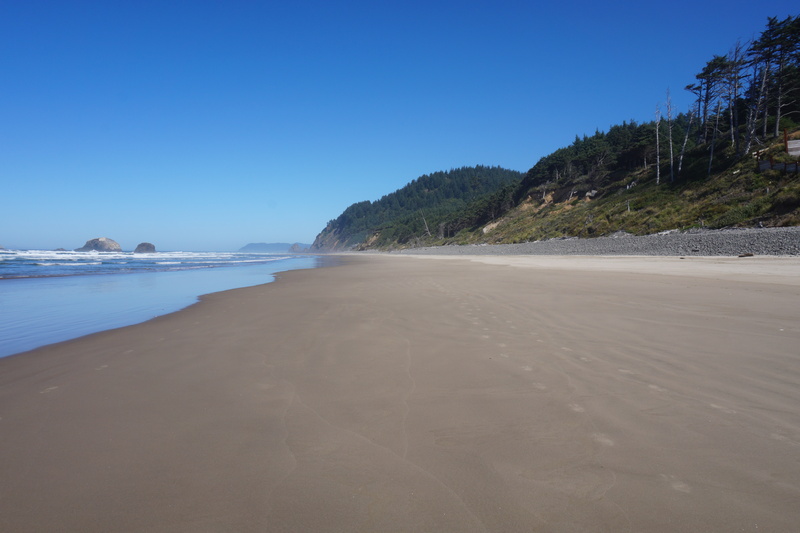 Gorgeous weather for Cannon Beach…very sunny and warm. 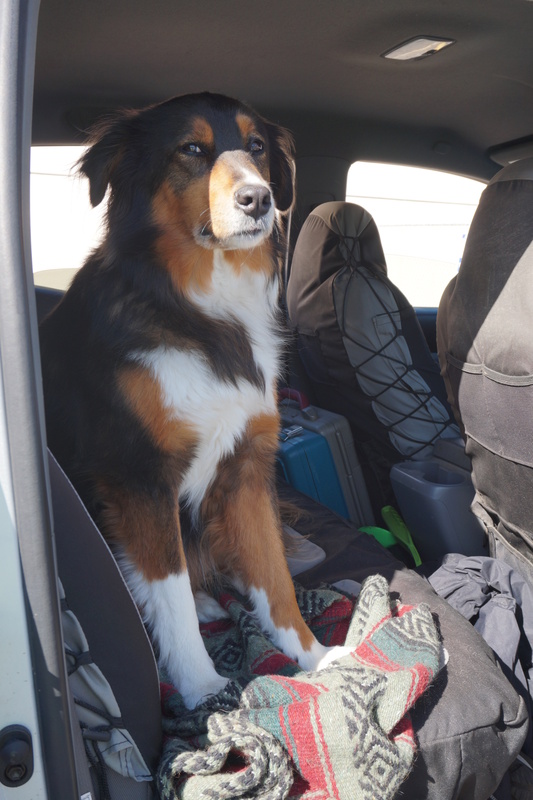 This gorgeous girl was waiting for her Dad to finish his business at the Post Office in Seaside, OR. My Dad thinks her name is ALLIE, too. She was VERY focused on what her Dad was doing in the Post Office. 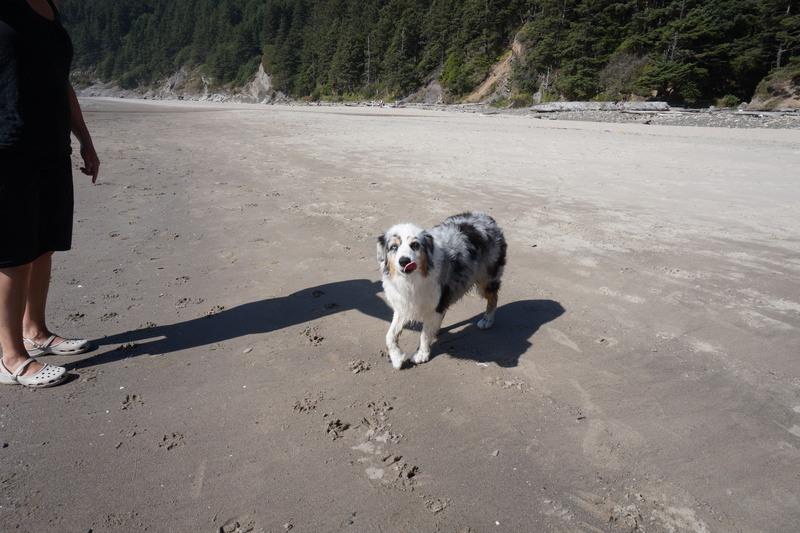 This gorgeous girl is another blue-merle Aussie who was walking Short Sand Beach with her Mom. My Dad, the wizard that he is, forgot her name. She was not too keen on My Dad petting her. These are three images from Falcon Cove, just south of the Arch Cape Area. The top view is looking to the south, the bottom view is looking to the north. My Dad and his sister were there for two hours and saw four people. The bottom image is of the beach at Falcon Cove during high tide. 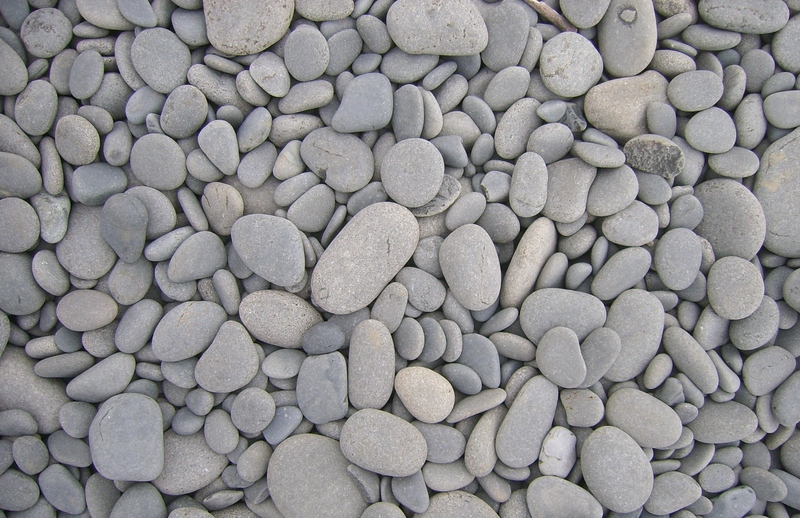 millions of smooth disc-shaped black basalt rocks. My Dad mentioned something about the location of the beach at Falcon Cove being a SECRET. 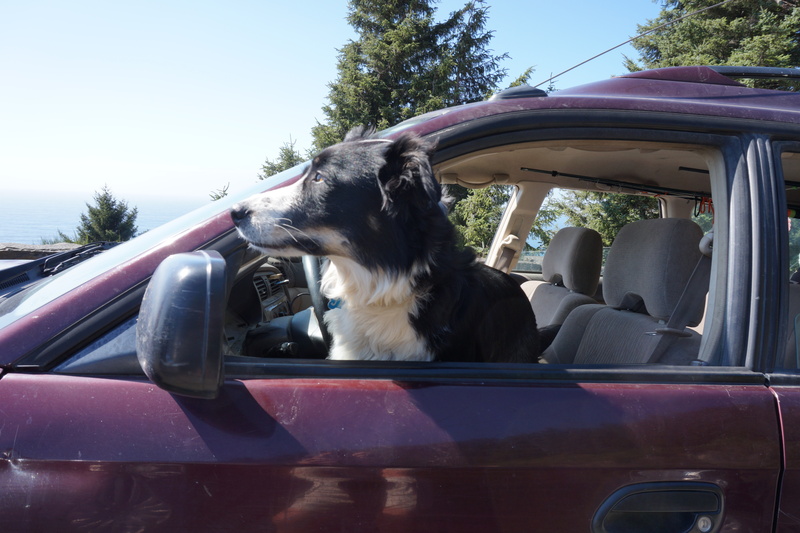 This entry was tagged border collie, Cannon Beach, dog, dogs, dogs and people, life with a dog, Oregon, Oregon Coast, pet rescue. Bookmark the permalink. Hi Cody, wonder if we need to start up a Support Group for dogs who get left behind whilst their mums and dads go off gallivanting and having fun WITHOUT them. Find a way to make them feel bad and guilty about it. ESPECIALLY when there are beautiful beaches involved. ESPECIALLY when they even look at other dogs. I can’t think what the penalty would be for playing with another dog.